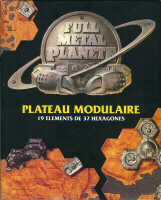 You thought of knowing everything of Full Metal Planète? Thanks to these 19 stiff cardboard modules, settable in an infinity of combinations, you go to be able to compose and discover dozens thousand unknown sectors of the mythical planet. You want a rather mountainous, rather swampy map? You prefer a big river across or a chaotic archipelago? No problem, it is you who decide. This box also contains an additional rule "specific to modules" which will get for you, by means of the box of origin, the pleasure of Full Metal Planète at power 19! The use of the modular board requires some modifications of rules below. There are no more zones of landing. A minimum distance from six cells with any already landed spaceship must be respected (pod to pod). Any ore situated in the zone of three cells of distance with any point of a spaceship disappears. All the deployed units have to be in a range of two cells from any point of the spaceship. NOTED: in case of nearness of two spaceships which can damage the deployement (of units under fire), the concerned players will put alternately a unit, within the limits of time granted (three minutes), the player who land first begins. Here is explained Full Metal Planète's favorite variant, played and tested by his inventors and an increasing number of fans. The game is normal up to the fifteenth turn, where every player puts on the board a second spaceship with in his edge a new complete army, and the game continues until the 21th or in the 25th turn. Every spaceship will land with a complete army (1 barge, 1 crab, 1 wheather layer, 1 pontoon, 1 big tank, 2 patrol boats and 4 tanks). The reserve is not reconstituted. Useless to hide you much longer, the variant using two spaceships requires two Full Metal Planète's boxes. It's better to use two boards, but much better is to use the modular board. When the last player played his fourteenth turn, cards tides of the fifteenth turn are organized, and the players proceed to a drawing lots to determine the order of landing of their second spaceship (three minutes maximum by player). A minimum distance from five cells with any already landed friendly or enemy spaceship (pod to pod). It is impossible to land a spaceship under the fire of enemy destroyers or on units. Ore in a range of three cells around the spaceship disappears. Once all the spaceships has land, all or any of their contents can be deployed, but necessarily on cells neighboring to the spaceship (only the second cell occupied by the barge is an exception to this rule). No unit can be deployed under the fire of opponent destroyers. We are always in the fifteenth turn. A new drawing lots takes place, which will determine the first player for this turn and the following ones. Other players will follow clockwise. But it is only possible to play five action points this turn. In this turn every player has a credit of ten action points for both spaceships. The players who possess now two spaceships have a basic credit of twenty points in every turn of the game (more five points per additional spaceship). Players who would have been lost their first spaceship before the fifteenth turn have naturally only a credit of fifteen points. As a capturated spaceship, a recently arrived spaceship contains and control of a set of equipment, different from the first spaceship (it is thus necessary to mark them with different colours). It is obviously possible to manipulate collectively all these units, but the capture of one of the spaceships will cause immediately the takeover of the material marked in the colours of this spaceship. As with the classic rule, it is possible to change the colour of these units by making them pass from a spaceship to the other one or by capturing them. ... The variant "Two spaceship" is generally, rather bloody. Good return or good continuation on Full Metal Planète, and do not hesitate to write to LUDODELIRE if a detail of this rule saddens you. We remind that boxex containing a supplementary complete army set of FMP are for sale for the ridiculous amount of 75 Fr terran.